The next 15 and 16 August, Jesper Rübner-Petersen will lead a Bluegrass / Oldtime Mandolin Workshop, at The David Hall, South Petherton, Somerset (UK), to introduce participants to play bluegrass/oldtime mandolin. Jesper was born on the 8th of July 1969 in Aarhus, Denmark, where he grew up with bluegrass and acoustic music, that his family loved so much. He began very soon to play guitar and performing at gigs and festivals all over Europe; then, in 1994, he approached the mandolin for the first time. It was a first-sight love that led him to modify his style and his way of living music. Since then, he also started a professional career as guitar and mandolin teacher, and even as book writer. 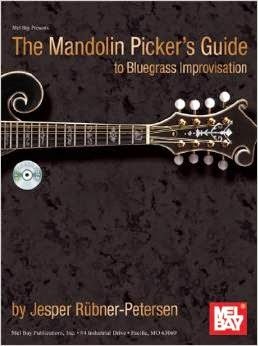 In fact, Jesper's book on Bluegrass improvisation (2010) has been a great success. Now, he's willing to share once again his expertise with the new participants of the next August 2015 workshop, in which both solo and back-up playing will be explored. Exercises for improvisation, work groups, and all-levels examples taken from bluegrass/oldtime standard tunes, or swing, jazz, Irish music will give every participant the chance to upgrade his/her own skills, and share ideas and techniques. If you are willing to participate and want to register, please send an e-mail to Will Helton . See website or write to Jesper to get further details.